The PSF is always thrilled to be able to help introduce young people to the world of programming. As such, Young Coders' Workshops (also see O'Reilly) are especially close to our hearts. Young Coders, for those of you who don’t know, was started in 2013 at PyCon in Santa Clara by Katie Cunningham and Barbara Shaurette (see My Dinner with Katie). Kids ages 12-17 learn to code using Raspberry Pis, which they then get to keep. Recently, the PSF has granted funding for PyOhio and for its Young Coders' Workshop. The conference will be held August 1st - 2nd on the campus of Ohio State University in Columbus, Oh, while the YC workshop will take place on Sat August 1 (see PyOhio). PyOhio serves as a regional conference for the Midwest with many attendees from surrounding states. Attendance at PyOhio has grown from 150 in 2010 to 400 in 2014. There will be 4 tracks of talks over 2 days and three days of sprints. This year’s schedule include a keynote by Catherine Devlin and talks by Brandon Rhodes and Brian Curtin among others. Registration is free (see PyOhio)! Brian Costlow, Chair of PyOhio, explains that the Young Coders Workshop targets kids who wouldn’t otherwise get the opportunity. PyOhio organizers reach out to partners to get the word out to those beyond tech circles. They reserve 40% of workshop slots for their partner organizations' for kids from disadvantaged neighborhoods. Last year in 2014, the kids came from one of the most economically distressed neighborhoods in Columbus (see Demographic Info). This year, the Boys & Girls Clubs of Columbus, OH is helping to recruit kids from poorer neighborhoods. We’ll pull kids from more than one neighborhood this year, but the highest median household income is $32,000 and all of the neighborhoods have at least 15% of households below the poverty line. By way of contrast, the median income for the Greater Columbus Statistical Metropolitan area is $44,000, but if you exclude the distressed neighborhoods, the household median income is around $80,000 and only 2% are below the poverty line. The PSF is happy to be able to help with funding for such a worthwhile event. Not only do the kids get to keep the Raspberry Pis, but they also go home with the keyboard, mouse, and cable. This is especially important for underprivileged kids who may not have access to computers outside of school. Other sponsors of PyOhio and Young Coders include Level 12, Safari, and Caktus Group, to name a few (see Sponsors). But sponsors are still needed, so there is still an opportunity to help! Please visit Sponsor Prospectus. I said that it can be run off of another device or from its own battery power. However, the latest and final version has eliminated the internal watch battery slot that was featured on the earlier prototype in favor of offering an external battery pack that can be attached. This was done as a safety feature, especially given the possibility of 7th year school children having younger siblings at home (BBC News). Last March, I wrote about a terrific educational project taking place in the UK, with which the PSF is proud to be involved (see PSF Blogpost). I am very happy to report today that the BBC micro:bit project has successfully launched! The BBC micro:bit release is part of the BBC’s Make it Digital initiative, whose purpose is to prepare a generation for the challenges of a tech-driven world. The project is a collaboration of 29 partners from industry, education, and government. Something simple can be coded in seconds – like lighting up its LEDs or displaying a pattern – with no prior knowledge of computing. All that’s needed is imagination and creativity. BBC Learning, along with the project’s partners, are providing educational resources and tutorials aligned with school curriculum, in an effort to ensure that teachers are ready when the micro:bits are distributed to students. With open-sourced specs and plans for a non-profit to oversee further educational use of the device, the micro:bit’s initial reach is sure to grow. Commercial development of the device is anticipated by the end of 2015. I urge Python developers to volunteer for this effort and to get involved in this wonderful educational initiative. You can read more about this project at: BBC micro:bit and BBC Learning. The PSF is happy to report that the third annual PyCon Singapore took place June 17 to 19, 2015. 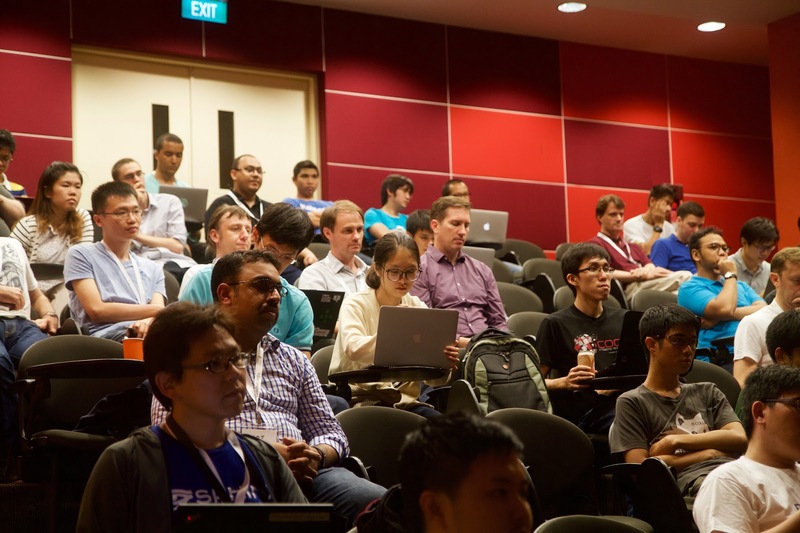 This event, organized by the Python User Group Singapore, is a testament to the robust presence of the Python community in the Asia-Pacific region. In addition to three PyCons Singapore, PUGS has held three PyCons Asia-Pacific. Congratulations to Ivan Zimine and the organizing committee for a successful conference. According to Ivan, “Feedback from the participants was mostly positive. Out of 18 responses, 7 people gave 4 out of 5 stars, and 6 people gave 5 out of 5 stars for the “How did you like PyConSG?” question." The event was attended by 181 people and was held on the campus of Singapore Polytechnic. It consisted of one day of tutorials and two days of talks. Tutorials covered topics such topics as unit testing, data stores, and beginning programming with Python and Django, and were attended by 96 people, of whom 64 were students. Lynn Root’s tutorial, “How to Spy with Python,” explained how the NSA and the UK’s Tempora programs can collect data on citizens' search histories, emails, IRC conversations, PGP usage, etc. As Lynn was clear to point out, however, the talk was not an endorsement of spying or a how-to, but rather a “… way of understanding the current political environment, as well as indirectly understanding how to protect one’s privacy” (see How to Spy). The summit included a talk by Praveen Patil titled Python in my Physics classroom about how to incorporate computer science into the science curriculum using ExpEYES, an Open Source Pocket Science Lab (https://pycon.sg/schedule/presentation/59/). Here are some links and pictures of the event: PyCon Singapore, Blog Post, Group Photo, Welcome.